The writers strike has been going since November 5th and there's been plenty of TV casualties, but the strike is all but over. A tentative deal was announced Saturday, and has since then the WGA leaders have voted unanimously to endorse the new deal between the Writers Guild and the TV networks & movie studios. Once the membership votes to approve the new deal (assuming they do vote for it as expected) the writers will return back to work by Wednesday. As I have throughout the strike, I'll continue to update the TV Show Remaining Episode list daily as this information is somewhat tentative and changing daily as the networks are working out their plans. What does the end of the strike mean to your TV shows? Many of them will return to life in early Spring. Things are looking very good for shows such as 30 Rock, Big Bang Theory, CSI (all of them), Desperate Housewives, Gossip Girl, Grey's Anatomy, How I Met Your Mother, Lost, The Office, Private Practice, Smallville, Supernatural, Two and a Half Men, Ugly Betty and more. Some other TV shows might not recover with new episodes until next season even with the writers strike over including Heroes and 24. 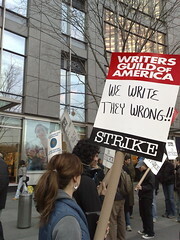 For the complete list - updated for the fact the writers strike is over head over to my Writers Strike TV Show Listing for all of the details by TV show.